Here’s a bloke I wish I’d given more attention to in No Applause. He was a pioneer whose career was roughly contemporary with Tony Pastor’s, (post-Civil War era) and claims to have used the term “vaudeville” to describe his variety shows before Pastor. The sorts of vaudevilles he put together, though, were the full-show, self-contained touring units that became superseded by the more modern circuits that were assembled towards the end of the century. 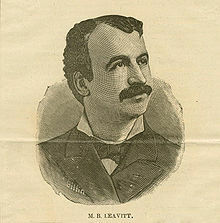 Leavitt is better known for his contributions to the field of burlesque. It was he who, inspired by the success of Lydia Thompson and her British Blonds, decided to wed the concept of an all-girl show to the format of a minstrel show — and for a time that was the shape burlesque took. He was instrumental in the creation of the burlesque wheels, and he often had as many as eight or more burlesque and vaudeville shows touring at a time. He was also a successful manager. Among his discoveries were F.F. Proctor, Alexander Herrman, and Harry Kellar. The last thing to know about Leavitt (other than that today is his birthday) is that he wrote an invaluable historical document, the gazillion page, soporific 50 Years in Theatrical Management. I was thrilled beyond measure to crack open a copy at the New York Public Library Performing Arts branch, not because of its contents, but because of the title page, which Leavitt himself had inscribed to Sophie Tucker. It looks like Sophie never even glanced at the contents, and the truth of the matter is, vaudeville fans, I scarcely did either. I have to confess that temperamentally I have way more in common with show tramps like Sophie than the suffering souls who wade through back copies of yellowing periodicals. I wanna go! I wanna step out, chil’run! I wanna shimmy! Hot-cha-cha-cha — whoopie! ….sorry. To find out more about the history of vaudeville, consult No Applause, Just Throw Money: The Book That Made Vaudeville Famous, available at Amazon, Barnes and Noble, and wherever nutty books are sold. I was doing a bit of research into vaudeville acts for a recent drawing I was working on and ended up on your blog. Enjoyed your drawings!